Technology is now transforming the business environment: Starbucks launched its mobile app for order&collect, to shorten their ordering queues; IKEA integrated Augmented Reality to let customers preview the products at their own home; Spacebox provides on-demand storage solutions with its online platform, removing the need to go to the storage warehouse. You can expect your customers are embracing technology in their daily life. How can you identify business opportunities to grow your SME business further? In this 2-hour event, we will inspire you in different ways that you can grow your business/get more customers with technology. 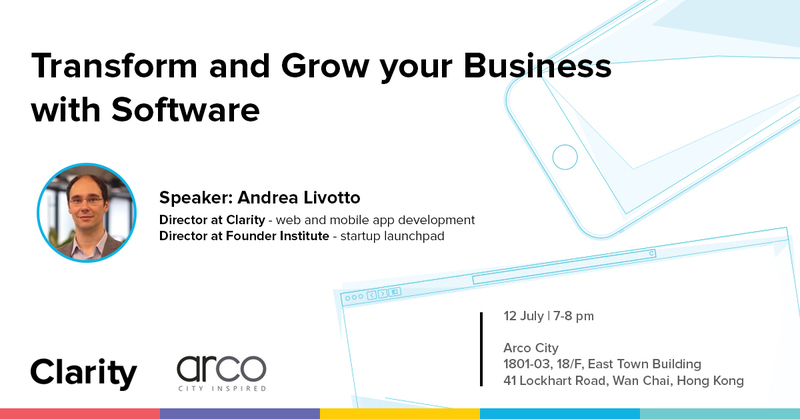 Andrea is director of Clarity, co-director of Hong Kong’s chapter of Founder Institute, an early-stage startup incubator. arco city Co-working Business Center is situated in the central hub of Wan Chai. It provides office spaces, business services, and virtual offices for business professionals across Hong Kong.